* Pure-cultured Spirulina in combination with the proper vitamins, minerals and amino acids provides a very rapid color enhancing effect while developing an extraordinary gloss and luster. * Wheat-germ rich offering superior digestibility and ready assimilation even when water temperatures are cooler. * Naturally high in vitamin E derived from a select portion of the wheat-germ kernel which has been proven to improve organ health, increase fertility and repair skin abrasions naturally. * Promotes balanced growth, free of fat deposits, allowing your koi to develop to their full, natural potential. 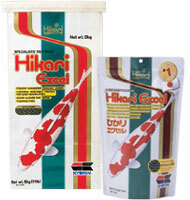 We recomend Hikari Excel as a daily diet forAll koi as a daily diet where improved growth are desirable.